It was roughly four years ago and some change when Pahrump resident and Navy veteran Pauline “Polly” Pavlick was bestowed a very prestigious honor. Selwyn Harris/Pahrump Valley Times Pahrump resident Pauline Pavlick wears a quilt courtesy of the Shadow Mountain Quilters during a gathering back in 2015. Pavlick was also honored back in 2013 with a U.S. Flag which flew above the U.S. Capitol. Pavlick, who passed away in late October, enlisted in the Navy WAVES from 1944-to-1946. Back in April of 2014, Pavlick, 93 at the time, was presented with a flag flown above the nation’s capital. Friends, neighbors and family, along with members of the Pahrump Valley High School Jr. ROTC, expressed their respective gratitude for the World War II veteran’s service to the country. She died in Pahrump on Sunday, Oct. 21, 2018. Pavlick, born in Detroit, enlisted with the Navy WAVES in 1944 and served for two years in the Washington, D.C. area as a company clerk. She prided herself on being precise so that sailors would have accurate records. According to her obituary, tired of the brutal Michigan winters, Pavlick moved to Pahrump in 2010 to be with her niece, Lili, so both could be near Lili’s sister, Betty and her husband. “Polly never sought the limelight, but she, as the oldest female WWII veteran in Southern Nevada at the time, was privileged to receive a flag that flew over the U.S. Capitol in 2013,” the obit noted. Adding to that honor was the fact that Nevada Senator Dean Heller gifted Pavlick with what’s known as a “Quilt of Valor,” back in 2015. She, along with more than two dozen other local veterans, were recognized for their valor and sacrifice as members of the military. The crafters who make the one-of-a-kind quilts are from Pahrump’s Shadow Mountain Quilters group. 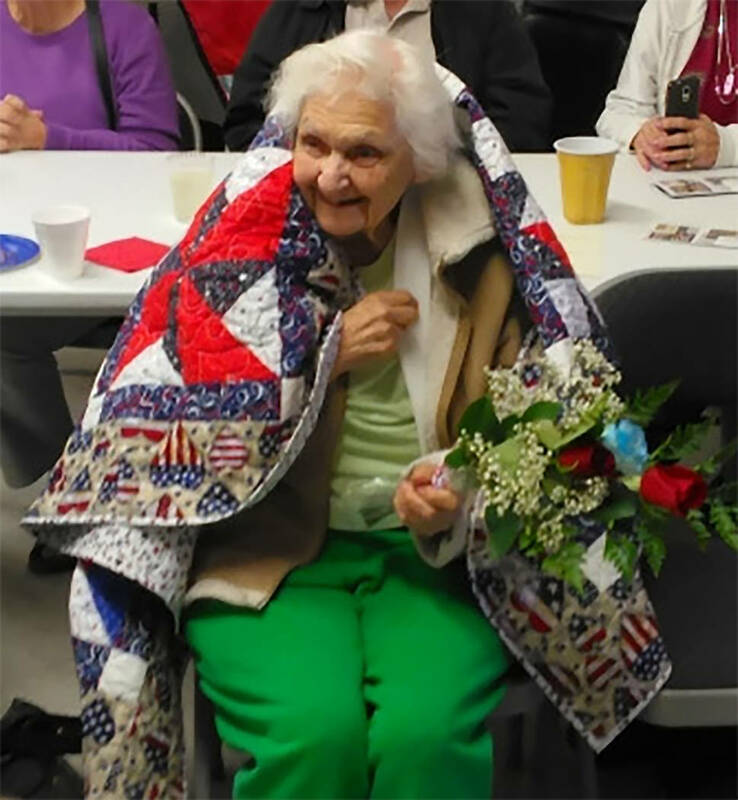 Their mission is to comfort servicemembers and veterans touched by war with comforting and healing Quilts of Valor. The group has been in existence since 2003. Born April 28, 1921, Pavlick was the second youngest in a family of six children. Survived by many nephews and nieces, Pavlick was preceded in death by her parents, Mamie and Floyd Pavlick and her siblings. A celebration of her life will be held at Our Lady of the Valley Catholic Church on Gamebird Road at 11 a.m. today, Friday, Nov. 9, 2018. In lieu of flowers, the family asks that donations be given to the Fischer House for families of veterans at the North Las Vegas Veterans Hospital, to Nathan Adelson Hospice, or to a local food bank.